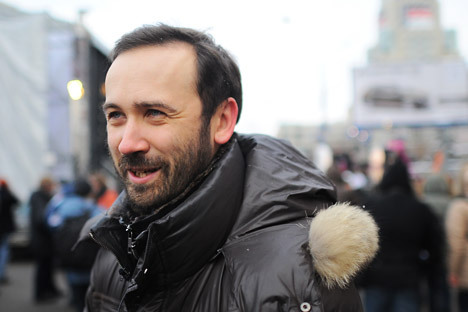 Duma member Ilya Ponomarev is one of the leaders of the anti-government protests that have shaken the Russian capital. Russia Beyond the Headlines’ Moritz Gathmann talked to Ponomarev about the demands the protestors are making and what they hope to accomplish. Russia Beyond the Headlines: Mr. Ponomarev, are we witnessing the end of the Putin era? Ilya Ponomarev: This is obvious. Whether he is once again elected president depends on the work of the protest movement, on how well we coordinate our activities. The country is already no longer the same. RBTH: The protest movement comprises many different groups: Communists, Liberals, Nationalists. Does it have a chance of success? I.P. : So far there have been no serious disputes, even though there have been some attempts to fuel conflicts. RBTH: But the movement has now split into a political part – the Citizens’ Movement – and a civil society part – the League of Voters. The representatives of the League, including prominent writers such as Lyudmila Ulitskaya and Boris Akunin, seem to be studiously avoiding association with politicians. Why? At the age of 16, Ilya Ponomarev founded his first company selling computers and software. He also worked as an IT expert for the Yukos Group, which was later dismantled by the government. Since 2010, Ponomarev has been in charge of international cooperation and technology commercialization at the Skolkovo Foundation. Politically speaking, Ponomarev describes himself as leftist: A member of the Communist Party until 2006, he founded the Left Front in 2005. In 2007 he was elected to the State Duma as part of the Just Russia party. Ponomarev is one of the initiators of the protests against election fraud that began in December. I.P. : Russians have a very bad attitude towards politicians. They do not trust them. This is entirely justified by politicians' behavior in the State Duma. Nobody wants to be part of a movement led by politicians, even if they represent the opposition. That’s why I greatly appreciate the formation of a group of moral authorities. These people have never taken part in political power games and guarantee neutrality. When this issue had been resolved, we were able to unite politicians. They are necessary, after all. Somebody has to formulate demands and write laws. RBTH: Do you believe that the participation of nationalists in the Citizens' Movement is a problem? I.P. : It is a problem, but it is unavoidable. We have an important principle. Anyone who participates in the protests, be it in Moscow or other parts of the country, must be allowed to join the movement. For me, nationalists have always been opponents, but in this situation, we have been able to agree on a common goal: free and fair elections. Therefore, we have chosen a white ribbon as our symbol: It unites all colors. RBTH: Is it possible that the "Siloviki" – that is, members of the secret service, army and police, as well as civil servants, all of whom profit from the system – will fight against its dissolution? I.P. : It is possible to profit in two different ways. You can try to get even more, or you can try to safeguard what you have. Currently, the elite tends more towards the latter. A good example is former Russian Finance Minister Alexei Kudrin, who took part in the demonstration on Dec. 24. The elite distances itself from Putin and talks of compromises –in order not to lose everything. RBTH: Does the rest of the country know about the demonstrations in the capital? I.P. : On Dec. 10, 7,000 people took to the streets in Novosibirsk. This is the absolute record since 1990, but we should not forget that Russian revolutions are made in Moscow. RBTH: You have been a member of the State Duma since 2007. Did you believe in Medvedev? I.P. : Yes, and I was badly disappointed. I considered myself part of Medvedev’s team. Of course, I thought it was possible that he would cede power to Putin. But not so cynically, without resistance! By doing this, he not only destroyed all his work of the past four years, but also his reputation. Medvedev the politician no longer exists. RBTH: But isn’t he supposed to become prime minister? I.P. : This is impossible. Nobody wants to talk to him anymore––neither the representatives of Putin’s elite nor those who believed in him. RBTH: Are you afraid that the regime might lose its nerve and use force to end the protests? I.P. : There is a quotation from Lenin: “The worse, the better." He meant that the defeats suffered by the tsarist army during World War I increased the chances for a revolution. What can a revolutionary dream of today? That Putin shuts down Internet access, arrests opposition politicians, and forcefully ends protests? This would lead to a fierce backlash. We are not interested in such a development, but if the regime chooses that path, it seals its own fate. It would cease to exist within a week. RBTH: Has the regime reacted to your demands? I.P. : There have not been any significant concessions. Of course, after the second demonstration, the government said: "Okay, let's re-introduce gubernatorial elections. All parties will have the opportunity to register.” But our main demand is re-elections for the State Duma. RBTH: In your opinion, what should Putin do next? I.P. : He should say: ”I understand that there can be no objective elections under the current conditions. If all candidates are prepared to withdraw, I will do so myself." Then the elections should be postponed for six months, and in the meantime the laws should be amended to allow for fair elections. RBTH: How likely is that? I.P. : Well, you can sacrifice a part to avoid losing everything. Putin is still a very popular politician, and I do not rule out the possibility that he will be elected president in fair elections.